I hope you can post this photograph on your website and perhaps someone can help with with a positive identification. My Mother-in-Law (Alice Joye Taylor Hill) has had this photograph for many years. All she knew was that the photo is of “Granny Taylor.” My Mother-in-Law was the daughter of George Charles Taylor (1907-1933) of Scott County, Virginia. What Joye did not realize was that she had two great-great grandmothers who could have been called “Granny Taylor.” I will send a family tree in an email to follow this one. The woman in the photograph is either Nancy Jane Salling (1842-1932), who was the wife of Milo Taylor and the mother of George Monroe Taylor…….or she is Nancy M. Dorton (1848-1931), wife of Monroe Taylor and mother of Mary Elizabeth “Lizzie” Taylor. Milo Taylor and Monroe Taylor were brothers, both sons of James Andrew and Catherine Stewart Taylor. Milo’s son George Monroe Taylor married his first cousin, Mary Elizabeth “Lizzie” Taylor, daughter of Monroe on 28 March 1888 in Scott County. On the 1930 Federal Census in the DeKalb District of Scott County, Virginia Nancy M. Dorton Taylor was living in the home of her daughter and son-in-law, George M. and Mary E. Taylor. Nancy Salling Taylor was living next door in the household of her son Mark Pomeroy Taylor. IF ANY ONE KNOWS ANY THING ABOUT J.W HILL OR HIS WIFE MIMA HILL PLEASE CONTACT ME THANKS. I have really enjoyed your site. Thanks so much for all the work you have done. I especially enjoyed seeing the Lawson Confederate Cemetery where many of my ancestors are buried. Keep up the good work. I really enjoyed looking at this site. A search of my great great grandfather, Monroe Taylor, brought me here. I was curious to see if anyone knows of why he changed his name and started another family? That is if I have the correct Monroe Taylor. Any help would be greatly appreciated. I would love to know the answer to your question also. Someone has to know or they couldn’t have made the connection. I have an idea who might know and I’m sure you must be related to her. Did your grandpa, Monroe Taylor, change his name to Joseph Jackson when he moved to Kentucky? If so, he’s my uncle by marriage! I have some information on him and his WIVES as he was married a total of 4 times. Marcie, my husband is a great-great-great grandson of Monroe “Joseph J. Jackson” Taylor (1845-1929). The Granny Taylor in this photo was his wife, Nancy M Taylor. Monroe left his wife and children, and crossed the mountain to Whitesburg, Kentucky where he changed his name to Joseph J. Taylor, married a woman named Lucy Elswick and had two sons. There is a story that he was afraid of being ‘framed’ for a crime he didn’t commit and that is why he ran away. Well, I’ve heard these stories from my aunts & my dad, but this is something I had found awhile back, can’t remember where though? Now I don’t know the details or how much of this is true and seems like I’ve heard something about him changing his name because he had murdered a man. If y’all find out anything otherwise, I’d love to hear it. Thanks! The story about the peddler and Monroe Taylor was printed in the book “From Log Cabins to the White House – A History of the Taylor Family” written by Mary Taylor Brewer. Mrs. Brewer was the daughter of Worley E. and Nanny Mann Taylor…and the great granddaughter of Monroe “Joe Jackson” Taylor. Hi, My grandmother was a Taylor from Scott County. I have been trying to find out for years about my family all I know is then her name was Lillian Taylor and she died when my mom was 3 years old and she believes her grandfathers name was C.W Taylor or something like that. Just wanted you to know,I enjoyed your site,have no known relationship here. Your site was nicely layed out and easily viewed. 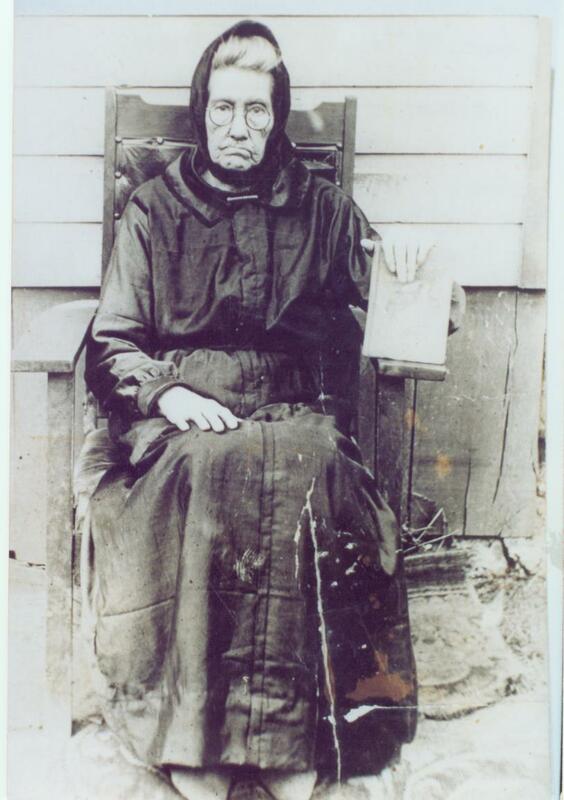 Several years ago, I shared this photo from my Mother-in-law of a Granny Taylor (her great-great grandmother). The problem was that my Mother-in-law’s great grandparents (George Monroe Taylor and Mary Elizabeth “Lizzie” Taylor) were first cousins and the Granny Taylor in the photo could have been the mother of either one of them. Both George & Lizzie were born to women named Nancy. Thanks to this Scott County website and Laura Hobbs, the mystery has been solved! Laura saw this photo on this website. Laura is a descendant of Milo & Nancy Jane Salling Taylor and has a photograph of Nancy Salling. This information enabled us to positively identify the photograph of Granny Taylor as being Nancy M. Dorton Taylor (1848-1931), the wife of Monroe Taylor and the mother of Mary Elizabeth “Lizzie” Taylor (Mrs. George Monroe Taylor). Thank You Laura Hobbs and Patty Jones for solving a mystery we’ve pondered for decades!